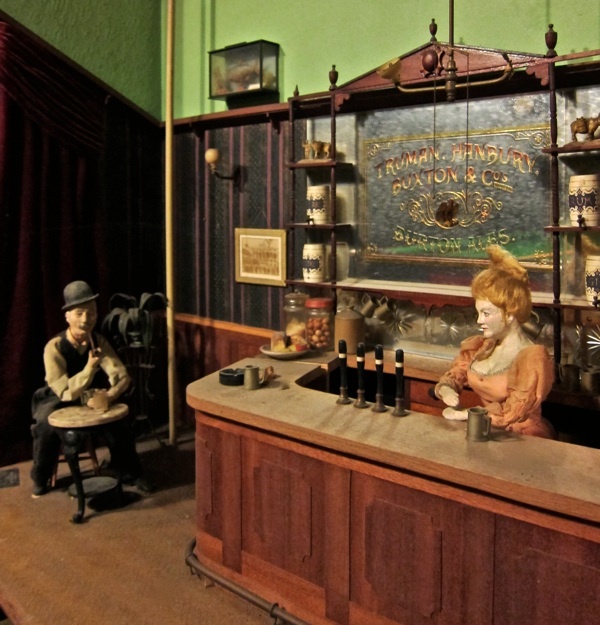 After a little detective work and a trip to Leigh-on Sea, I am able now to tell the full story of the Spitalfields Dioramas, due to be unveiled tonight by Mavis Bullwinkle in their new home at the Bishopsgate Institute. 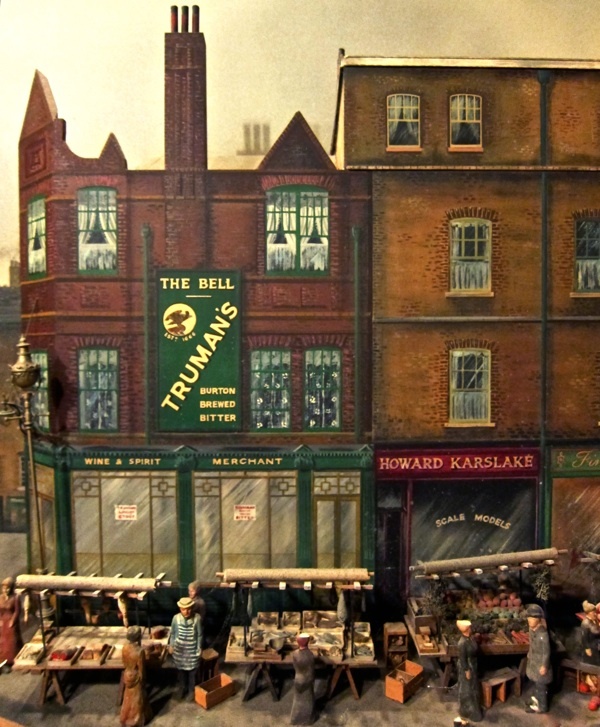 Truman’s Brewery commissioned the dioramas in 1972 for The Bell in Middlesex St from Howard Karslake, one of the top model makers of his day. They were designed to portray Petticoat Lane Market a century ago and, in the ten weeks they took to make, all the members of the Karslake family contributed to this epic example of the model makers’ art. 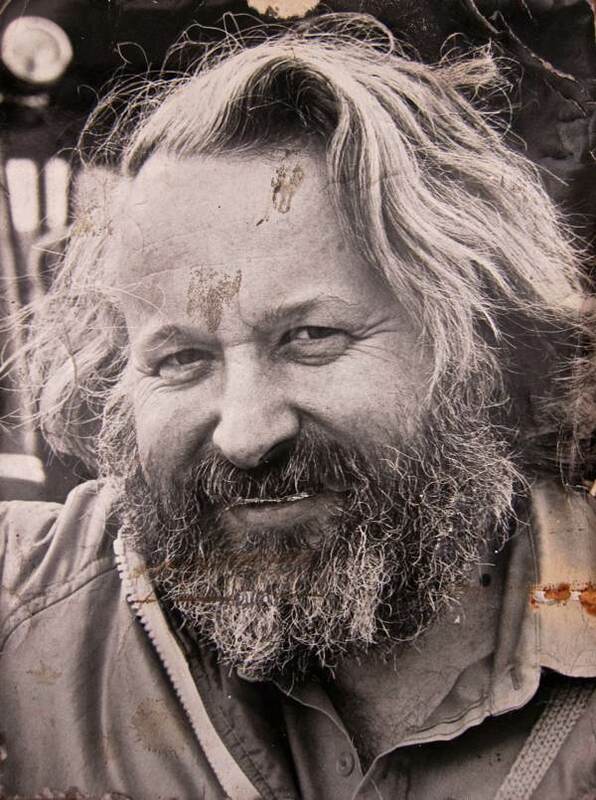 Howard Karslake died young at the age of just fifty-eight in 1995 and this evening his family will be seeing the newly-restored dioramas for the first time in forty years. So, as well as being a magnificent evocation of Spitalfields in times past, they are a memorial to a uniquely talented man. 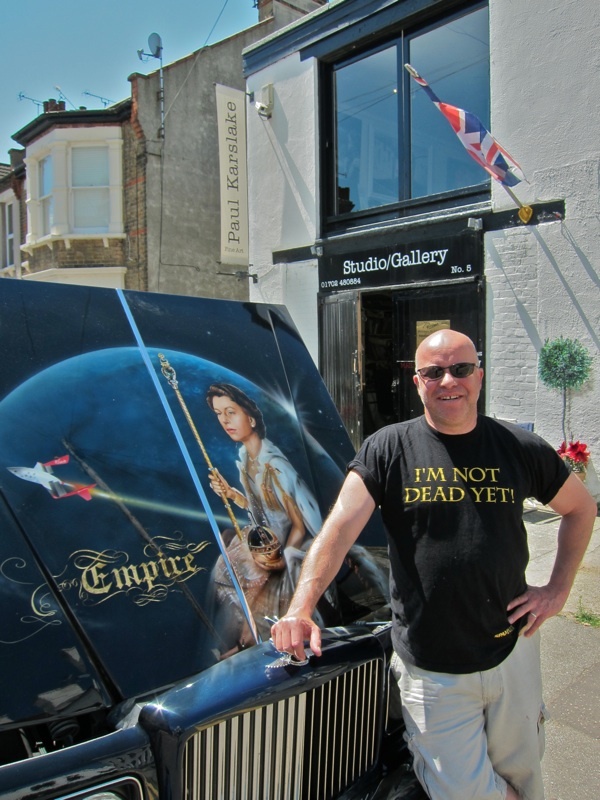 Today, Howard Karslake’s son Paul Karslake is a jobbing artist with a rock and roll style. He picked me up from Leigh-on-Sea railway station in a Bentley that he has customised spectacularly with scenes from British history, whisking me away to his studio in a former garage at the top of the hill which in its creative disorder – he told me – approximated closely to his father’s workshop. “My father was born Michael Howard Karslake in 1932. He became very interested in models of all kinds when he went into the RAF, where he worked as an undercover topographer making incredibly detailed scale models from maps that pilots could study as a reconnaissance before they went off on a secret mission. Later, he went on to make the architect’s working model of the Thames Barrier, the model of the pilot’s seat in Concorde and models of many of the big North Sea oil rigs. On leaving the RAF, he studied at Kingston College of Art in the same year as Terence Conran, and it was there he decided to become an architectural model maker. Then he fell in love with my mother Rachel who had just come over from South Africa and he got a job as chief model maker to Basildon Development Corporation, which gave him a council house automatically. And that’s where I was born. But he found the work bureaucratic at the development corporation and when he got in trouble one day for not wearing a tie, he left and set up his own model making business. He had a big shed in the back garden where he worked. Before long, he won the Queen’s Award for Industry for his model of the Piper Alpha oil rig and he was made a Fellow of the Royal Society of Arts. At one time, he had seventeen people working in his business. I used to come in after to school to help and I was honoured because he valued my skills, even though I was only fourteen years old at the time. We were both perfectionists, so we clashed because you could never criticise, but I am so glad that I worked with him. When the commission from Truman’s Brewery came along, he wasn’t that interested because it was different from his usual work but the rest of the family persuaded him to do it. At that time, Petticoat Lane was the East End equivalent of Carnaby St, it was the place to go for fashion and records. We all went there to have a look, it was bohemian and I loved it. I remember seeing Keith Emerson of Emerson, Lake & Palmer there in a mad coat. The Bell opened at midday and shut at two-thirty in those days, and they were so strict that I wasn’t even allowed into the pub. I only went in once when the models were being fitted, and the foreman from the brewery came along and said, “How old is he? He’s not allowed to be here.” Truman’s treated The Bell as a showcase. The pub had been beautifully refurbished by the brewery with a new juke box. It was very exciting. We began with the baseboard and then, using reference photographs, we created false perspectives and worked out where the figures were going to be. We had to set a scale and keep to it. My dad’s rule was, “If it looks right, it is right.” I remember turning the pickle jar in perspex. The biggest part of the job was the mirror behind the bar at The Bell which was etched in acid. I had to learn to do it very quickly, and then I did the gold leaf and the green enamel paint. This was where I first did airbrushing, which is the main technique I use for my paintings today. The entire family, we worked six days a week for ten weeks to complete the models. My mother Rachel made all the figures and I painted the balloon in the sky over Brick Lane and did some of the sign writing, such as my father’s name over a shop, while my little brother Vincent painted all the lettuces.We created portraits of everyone we knew, and I am in there several times. 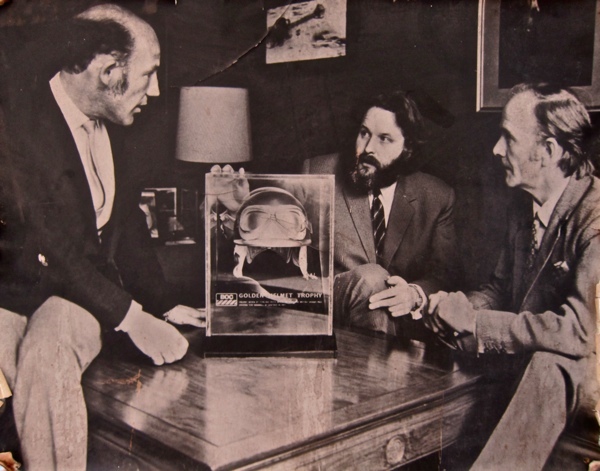 Howard Karslake (centre) presents the trophy he designed to racing driver Stirling Moss (left) in 1967. 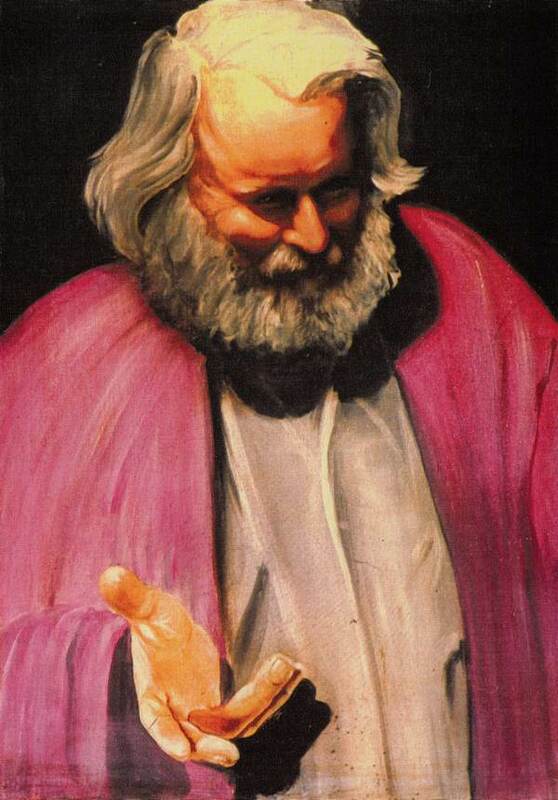 “Telling God a joke.” – Paul Karslake’s portrait of his father, 1997. Paul has fond memories of making the pickle jar and the fish in a box, which is a roach and is based upon an original in his mother’s possession of 1821. The mirror behind the bar is of etched glass created by the same process as a full-size one. The landlady was made by Rachel Karslake, Howard’s wife, as a self-portrait using her own hair. 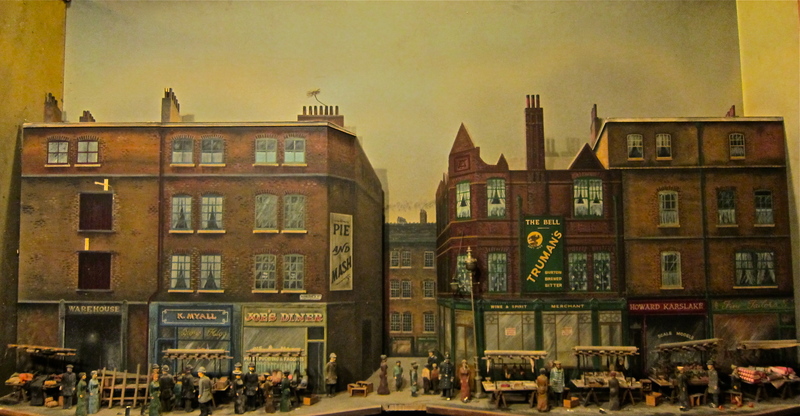 Click on this picture to explore the diorama of Petticoat Lane. If you would like to attend the unveiling tonight please email Stefan.Dickers@bishopsgate.org.uk to put your name on the list. The dioramas will remain permanently on display in the Bishopsgate Institute Library to be viewed during opening hours. Wonderful. I’m planning a trip to London in autumn and I’ll be sure to go and see them. A completely fascinating post. Thank you.